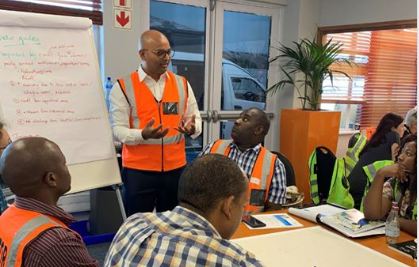 Business, community and NGO leaders gather to discuss water risks and solutions at Kimberly-Clark’s Epping mill in South Africa. In 2018, after a three-year drought, Cape Town, South Africa, became the first major city to come within days of running out of water. As “Day Zero” approached, residents were limited to 50 liters of water a day. Businesses had to evolve processes to reduce water usage. The Kimberly-Clark Epping mill is located just outside of Cape Town. The company knew that if Cape Town ran out of water it would be a threat to the business. Even more, it would be a threat to the surrounding community and Kimberly-Clark’s employees’ way of life. Kimberly-Clark’s Sustainability 2022 water strategy takes a multi-stakeholder, local-facing approach to mitigate water risk. As the water crisis in Cape Town mounted, the company partnered with WWF to understand the local risk and started engaging with the local government. The company also began leveraging WaterLOUPE, an innovative tool Kimberly-Clark developed with Dutch research group Deltares. WaterLOUPE shares data and insights on current and future risks to local water resources. The tool raises stakeholder awareness and provides a platform that encourages collaboration in developing sustainable water management plans. Last month, Kimberly-Clark and Deltares gathered over 30 individuals from local and municipal government, local businesses, and NGOs at the Epping mill for a water scarcity workshop. The workshop engaged stakeholders to look at risks for the entire watershed and align objectives. Using the data from the workshop, a WaterLOUPE water scarcity risk dashboard will be created, which can be utilized to scientifically model potential solutions. Kimberly-Clark and Deltares will gather stakeholders for a follow-up workshop in August to discuss strategies. Cape Town was able to avoid “Day Zero” but the threat is still there. Local engagement and WaterLOUPE is working to drive collective action for sustainable water stewardship in Cape Town and other water-stressed regions of the world. Watch a preview of Kimberly-Clark’s mini-documentary on the water risk workshop on our Facebook page, and read more on Sustainability2022.com about our work in water-stressed areas.